With the Mt. Baw Baw Alpine Resort Classic forming round two of the Victorian Road Series, rather than the historical 6 grades, 9 were contested on Sunday 14th April. The weather was slightly muggy in Warragul with a hint of rain that never eventuated until just after all riders had finished. There was not much in the way of wind, and with the exception of some mud along Sheffield Road and a few pot holes, the road was in good condition. Almost ideal conditions for the race. The final climb was closed to traffic for the most part, so racers could zig zag their way to the top and was much appreciated by many tired legs. Shane Miller (4th in Masters A) tweeted just after the event “Went to a very dark place today at #BawBawClassic. Epic. Brutal. Beautiful. Great event! (Argh, I cramped typing that)”. Yup, that sums things up nicely. Congratulations to the 219 riders who finished the race, especially the winners. Matt Clark (Charter Mason Drapac Development Team) winning his second consecutive Victorian Road Series event in Men’s A Grade, having also won the Mt Buller Road Race in mid March. Lucy Coldwell (Holden) producing a great ride to win Women’s A Grade over teammate Miranda Griffiths. 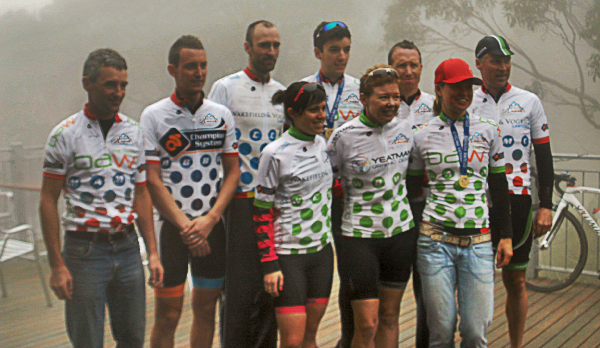 Lucy now leads the Women’s VRS standing, having placed second in the Mt Buller Road Race. 16 year old local Cyrus Monk (Warragul CC) finishing second in Men’s C Grade. Deborah Richards (Hawthorn CC) & Verita Stewart (Hawthorn CC) completing back-to-back victories in Women’s B & C Grades respectively. Women’s C grade finished quicker then Women’s B grade. Thanks go to Karin Jones (Race Director) and the Warragul Cycling Club for their tireless work to make this a successful event. See you all back next year. Matt Clark (Charter Mason) finished in a time of 03:21:51. Ben Dyball (Huon Salmon Genesys) was second (+0:59) and Robbie Hucker (Drapac), third (+2:37). In the women’s A race, Lucy Coldwell (Holden) was first up the mountain in a time of 3:59:19. Previous winner and team mate, Miranda Griffiths (Holden) was second (+2:51) and Lisa Barry (Bicycle Superstore) was third (+5:41). Adam Versteege (Carnegie Caulfield CC) claimed first place in 03:42:56, followed by Sam Gifford (St. Kilda CC) (+1:16) and Daniel Herrewyn (Mt Gambier) (+5:57). Women’s B grade saw Deborah Richards (Hawthorn CC) take out first place in 4:33:14, ahead of Elisabeth Rubie (Kooragang CC) (+0:22) and Emma Pane (Brunswick CC) (26:31). C Grade saw Jay Phillpotts (Hawthorn CC) cross the line after 03:43:49 in the saddle. Second was Cyrus Monk (Warragul CC) (+5:38) and Nicholas Kennedy (Carnegie Caulfield CC) (+7:54). Verita Stewart (Hawthorn CC) was first in a B grade beating time of 4:27:21. Next up was Jennifer Brown (St. Kilda CC) (+2:00) with local lady Kate Prestidge coming in third (+5:32). Here the Carnegie Caulfield CC dominated the podium. Danny Kah came first in a time of 3:40:48 with Michael Gallagher second (+0:46) and Ciaran Jones third (+1:05). Anthony Wallace (Carnegie Caulfield CC) took out first place in a time of 03:44:07. Paul Makepeace (Latrobe City CC) came in second (+5:01) with Matthew Ledgar (St Kilda CC) third (+7:20). Frank Nyhuis (Blackburn CC) was first across the line in 3:56:48. Greg Castelow (St Kilda CC) came in second(+2:12) with Craig Keane (ADF Cycling) claiming third place (+4:52). This entry was posted in #BBC2013, Sponsors and tagged #BBC, #VRS, Race Report. Both comments and trackbacks are currently closed.